When I think of winter many things come to my mind, but one of them that sticks out in the forefront is eggnog. Like candy cane ice cream and gingerbread latte's, eggnog is only in the stores at certain times of the year. In my home, as a kid, when eggnog made it to our fridge we were always given strict instructions of when we could drink it. My grandparents wanted it to last longer than the few hours we would have consumed it in without the rules. We were allowed small glasses and it was considered a luxury. My son and I are the only ones that drink it in my little family. Both my daughters and husband don't like milk. I think the thick texture and eggy flavor turns them off. Drake and I buy one small quart bottle and we savor every small glass so that we too can stretch out the small sips of a favored holiday treat. When that is empty I buy another one. By the time is all over, we have probably consumed a gallon over two months. I wish I had a homemade recipe to share but I have not yet found one that I love. Each year I give it my best effort and spend the time and money buying the ingredients to try another batch of homemade eggnog and each year it does not meet my standards of excellence. So I buy the best eggnog I can find. I think this is important. I have tried the generic brands and I don't think they have the rich flavor and texture that some of the high end brands do. This recipe came to me by way of my MIL when I first got married. 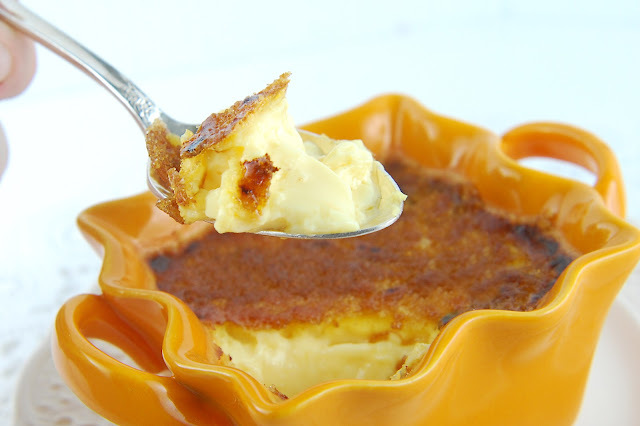 She knew I enjoyed eggnog and showed me how to make this easy eggnog version of burnt custard. I have only made it a few times because I always forget about the recipe. 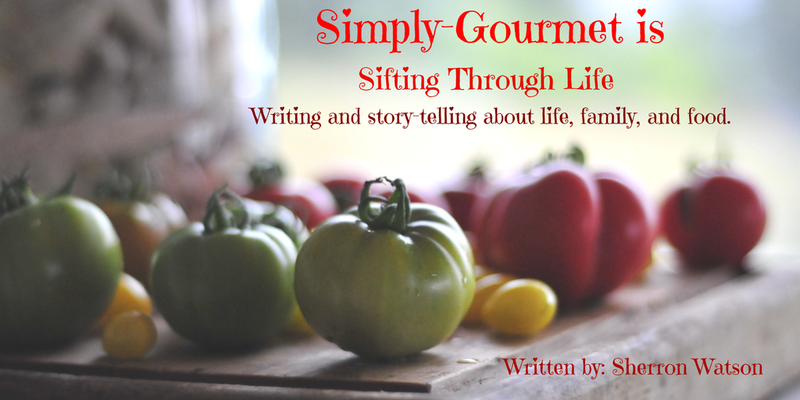 It is only when I sit down with the family box of recipes and look for something new to try that I rediscover some of our oldies, and this is one of them. The key to cooking the custard is putting the bowls in a water bath. You can see below that I use a square baking pan and it fits the four small dishes perfectly. I fill the water almost two-thirds of the way up the side of the pan. These cute little bowls hold about a third of a cup each. From this recipe, I was able to get 5 servings. To make the crisp topping you don't need to add very much brown sugar. I learned this the hard way one time. If you add too much then if does not get the crispy shell and has a tendency to burn. I do make my own brown sugar though and this is a very easy thing to do. You take 1 cup of plain white sugar and add molasses to it. 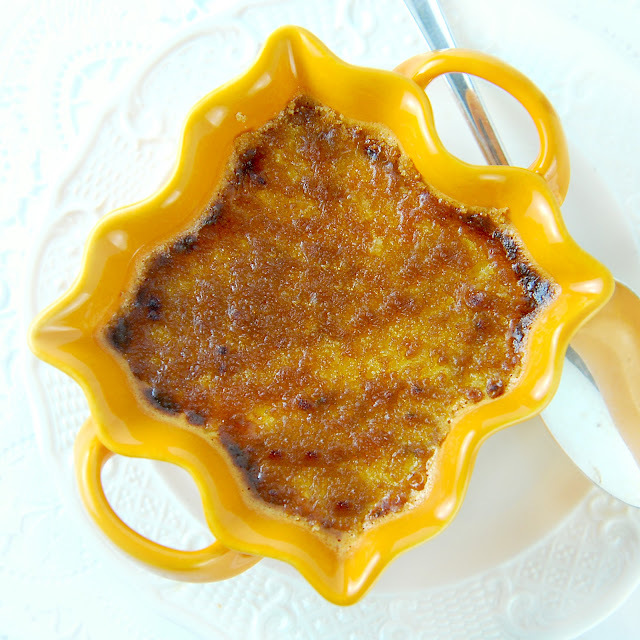 I usually start with 1/2 teaspoon and add more if I want the brown sugar to be darker. Warm eggnog in a small pan until tiny bubbles form. Remove from heat. In a bowl, beat eggs until thick and creamy. SLOWLY whip the eggs into the hot eggnog. Pour into ramekins. Add water to a baking pan large enough to hold ramekins. 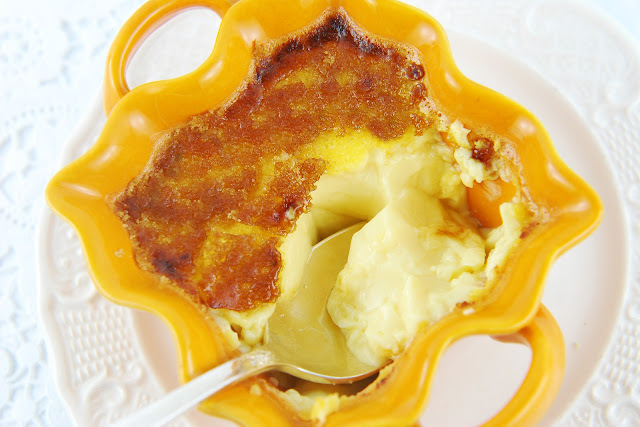 Water in baking pan should only be two- thirds of the way full and do not allow water to over flow into custard. 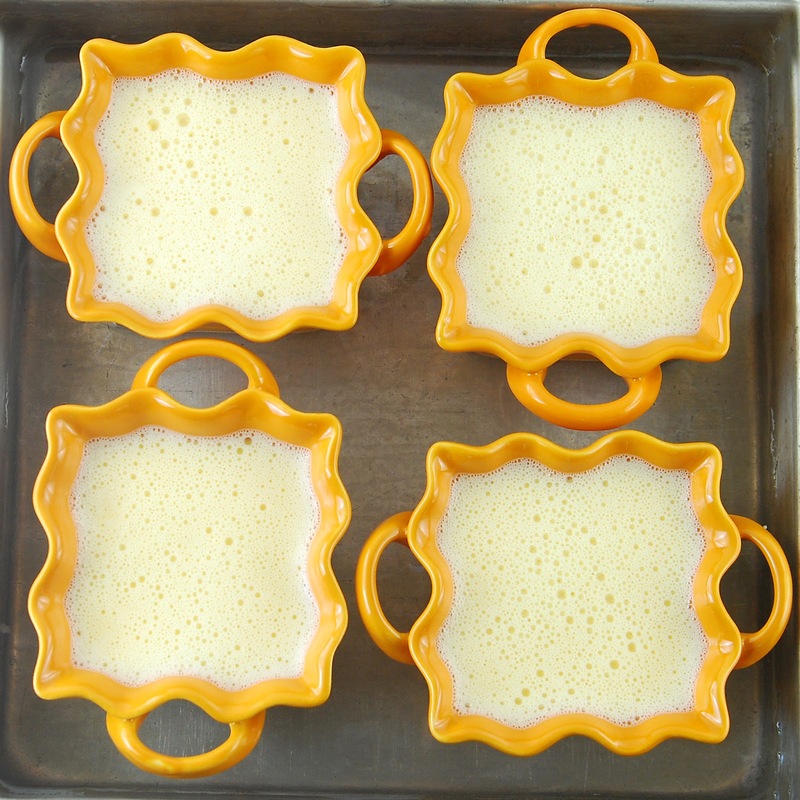 Turn broiler on, remove ramekins and sprinkle brown sugar over the top of each dessert. Broil until brown sugar is melted. Remove from oven and let sit for a few minutes to harden. Serve on a small plate as the ramekins may be hot to the touch. Holy smokes that eggnog custard looks/sounds scrumptious! I'm excited by how simple it looks to make... three ingredients?! Your ramekins are gorgeous! They'd make me want to make custards often! How simple and clever! Finally, a way to enjoy eggnog that I can really appreciate. My husband will be all over this, can't wait to make it! Here's an easy one to make, and delicious. Beat together eggs and sugar until foamy. Slowly stir in rum. Mix well. Then slowly stir in half and half. Fold in whipped cream. Pour into serving glasses and sprinkle with nutmeg. Thank you! I will give this recipe a try this month. Have a fabulous day! Oh wow. This looks AMAZING! !